Whether you’re the kind of person who loves a splash of drama or you avoid conflict at all costs, obstacles are a fact of life. You can worry about them or pretend they don’t exist, but what you’re really trying to do is take control of your life. You want that complication gone! But instinctive reactions aren’t always the best way to solve problems. Feelings can get hurt, and issues remain unchecked. Whether you’re going back to school or starting a new job, know that you can prepare yourself for issues that arise. For solutions that stick, you need a holistic approach, so leave the drama at the door and try out this new skill set! A holistic approach means thinking about the big picture. Whether you’re doing holistic parenting, holistic website design, or holistic medicine, know that each change you make to one part affects the whole. 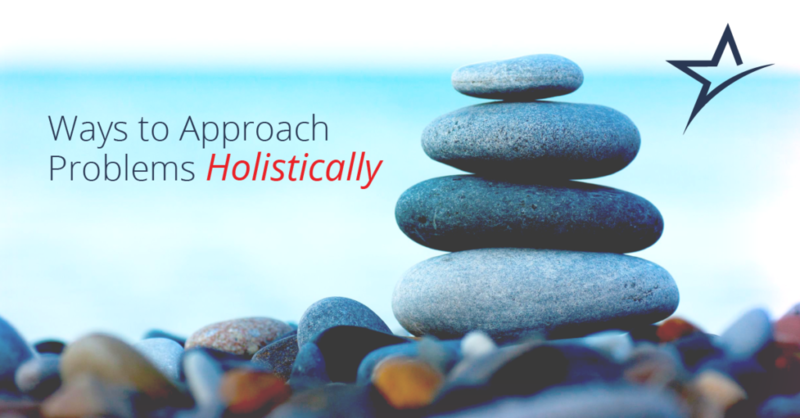 In a medical setting, holistic refers to addressing the whole person, including their physical, mental, and emotional health, while taking social factors into consideration. This could be specific to diagnosis, in which case a holistic approach might consider all possible symptoms; or holistic treatment, which may be very creative and empowers the patient to take charge of their own care. Holistic medicine includes conventional and alternative treatments. Related resource: What is Holistic Nursing? A holistic approach starts when you identify an obstacle, then take a step back to understand the whole situation. Responding to other people can be tough. To solve interpersonal problems holistically, start by looking for the root cause of conflict. It might not be what you think — and a superficial solution might not fix it. The problem: You’re stuck on a single way of looking at a problem or solution and unwilling to think about it differently. You think since it worked before, it’s guaranteed to work again. This kind of rigid thinking resists compromise. The holistic solution: You might be wrong! Or everyone could be wrong. Or you might be right, and there could still be a better way. Consider that there might be a solution you haven’t thought of yet. The problem: Interpersonal blow-outs are often rife with irrelevant information. You’ve probably experienced a conflict with a sibling or significant other in which the actual fight (for example, failing to unload the dishwasher) was actually about something very different (resentment about chores not being split evenly). The solution: In a cool-headed moment, assess what parts of the conflict are related to the issue, and which are about something else entirely. When a problem is very complex, solutions come easier when you push misleading or irrelevant information to the background. The problem: When dealing with a complication, people often make assumptions about the constraints and obstacles that prevent certain solutions. The solution: Try to examine everything you think is true about the situation … and then consider that it’s not. The other person might not have the same information as you. They might have interpreted something differently. The problem: No one likes to hear that they are at fault and need to change. If someone hears they’re wrong, it’s natural to be defensive — which does not fix the conflict! The solution: Use “I” statements to explain your position in a neutral way. For example: “When I feel rushed while charting, I fear I don’t have enough time to do a thorough job.” After all, the only person you can control … is you! In the medical world, solving for patient issues from a holistic approach is quite specific. It includes several principles (which sound very similar to the interpersonal approaches listed above). These can also be applied to life’s problems! Solving problems holistically means examining the whole behaviour. The key to a patient’s problem might not be obvious; the issue might be found in thoughtful consideration of the whole person. Another effective way to solve for daily conflicts and discussions or a patient’s medical issue is active listening. When someone vocalizes what they’re feeling, repeat it back to them. This is especially helpful in speaking with patients. It reinforces the feeling that they’re being listened to and creates empathy and appreciation. It’s also an opportunity for the patient to refine or correct their statement to ease misunderstandings. Ameritech’s nursing and RN-BSN programs are based on holistic nursing principles. Our program continues a proud holistic nursing tradition, which dates back to the work of Florence Nightingale. Visit our program pages to learn more about our nursing and RN-BSN degree programs.